1. Boil a kettle. Rinse the brown rice and place in a saucepan with 400ml boiling water and a pinch of sea salt. Simmer for 20-25mins until cooked. 2. Finely chop or crush the garlic. Finely dice the onion and finely chop the mushrooms and the parsley. Drain and rinse the lentils. 3. Heat a medium-sized pan with 1 tablespoon oil on a medium heat and add the onion and garlic for 7 mins until softened. 4. Then stir in the mushrooms and cook for a further 5 mins. Add the chopped tomatoes, tomato puree, fresh parsley, dried oregano and dried thyme. Season with sea salt and black pepper and cook for 2 mins. 5. Then reduce the heat and add the lentils and the red chilli flakes (use as many as desired) and cook on a gentle heat for 10 mins, stirring regularly. Add a little boiling water to the pan if the sauce becomes too dry. 6. Drain the brown rice. 7. 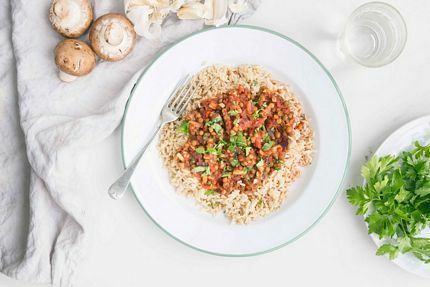 Serve the brown rice on two warm plates and top with the mushroom bolognese. All delivered straight to your door along with cooking directions from Mindful Chef.